A few success stories that demonstrate the capabilities of liveSite and Camelback Web Architects. Collin Street Bakery has been a leader in the gourmet gift business for over 100 years. For over a decade, they have relied on liveSite to power their massive e-commerce website which handles multiple-shipment orders for their famous perishable treats. In all that time, we are proud to say we have never lost an order, nor had to take their site offline for maintenance, even through several site design overhauls. This is quite an accomplishment since on their busiest days, their website has to collect several orders per second from well over 1 million customers in 296 countries! When they wanted online orders to be securely and magically appear in their on-premise fulfillment system, we jumped in and wrote the middleware to make it happen. We also integrated their unique ‘Gift List’ feature, so even offline customers could reorder from their website with just the click of a button — even if that meant an order with over 900 shipping addresses on it. When they expanded into shopping malls and airports with automated sales kiosks, we used liveSite’s ‘kiosk mode’ to create a new and unique kiosk shopping experience without any additional technology to purchase and maintain. 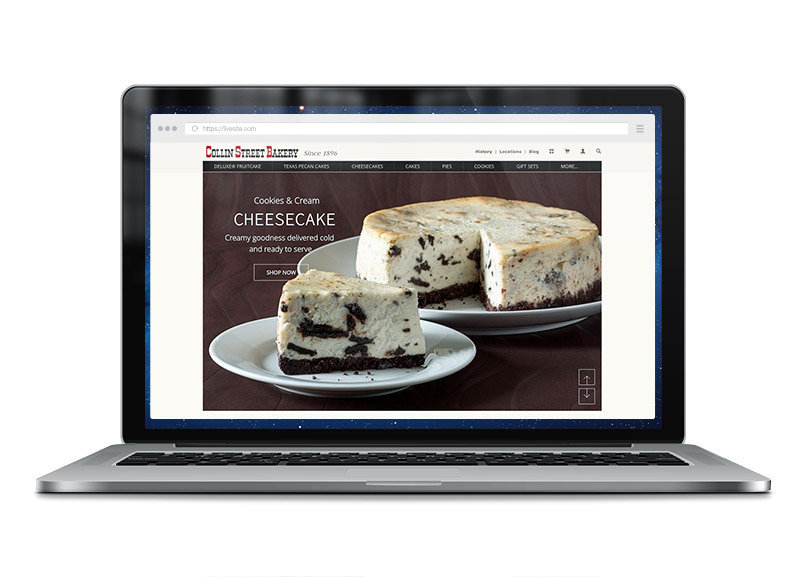 When their retail bakery stores wanted to save money and go paperless, we used liveSite’s flexible workflow & apps features to create a protected portal they could access from their tablet computers to get real-time reports of activities and inventories so they wouldn’t have to incur additional costs or manage another technology platform. The Roman Catholic Diocese of Fort Worth has more than 560,000 Catholics in 97 parishes and missions, 20 schools, and served by 123 priests, 110 deacons, 24 sisters, and 5 brothers. With a community this large, they needed a website that could disseminate news and event information quickly to not only their parishioners and the public, but also between parishes, schools, and clergy. They turned to liveSite to provide an single sign-on solution for their intricate internet, extranet, and intranet content management needs. With liveSite powerful access controls they were able to create calendars managed by each group, portals with classified ads so parishes and schools could swap unused equipment and resources, and private forums where clergy could discuss church business from their remote locations. liveSite took the place of their website platform, church and school finder mobile app, and their Microsoft SharePoint server, reducing their cost for these services by 95%. The main site was so successful, they migrated and launched 3 additional liveSites for other ministries they oversee, further leveraging their website platform, components, and training. 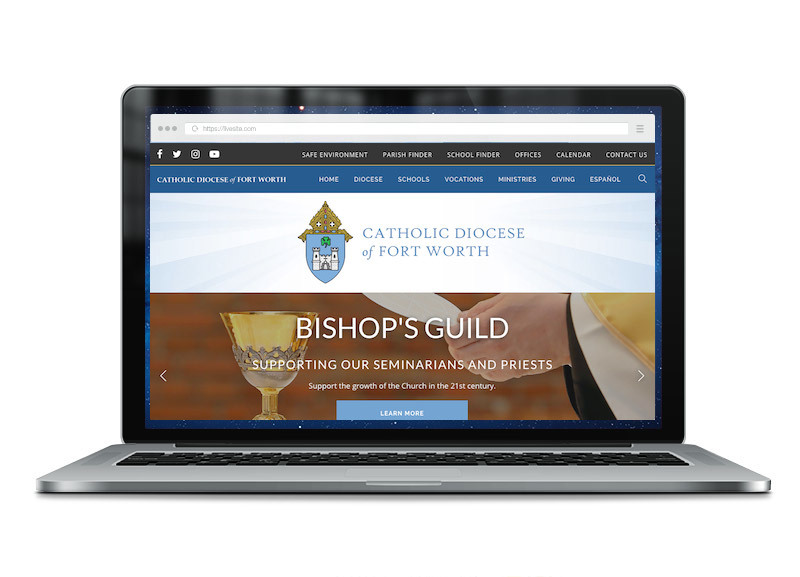 liveSite also powers the equally impressive Roman Catholic Diocese of Dallas. The Tkach Law Firm provides a one-stop shop for legal services related to victims of automobile accidents, job-site injuries, criminal defense, and traffic citations. Their success stems from their methodical and aggressive approach to defending their clients, and their amazing processes that keep their clients informed every step of the way. This commitment to making legal services easier on their clients has fueled their growth over the years. 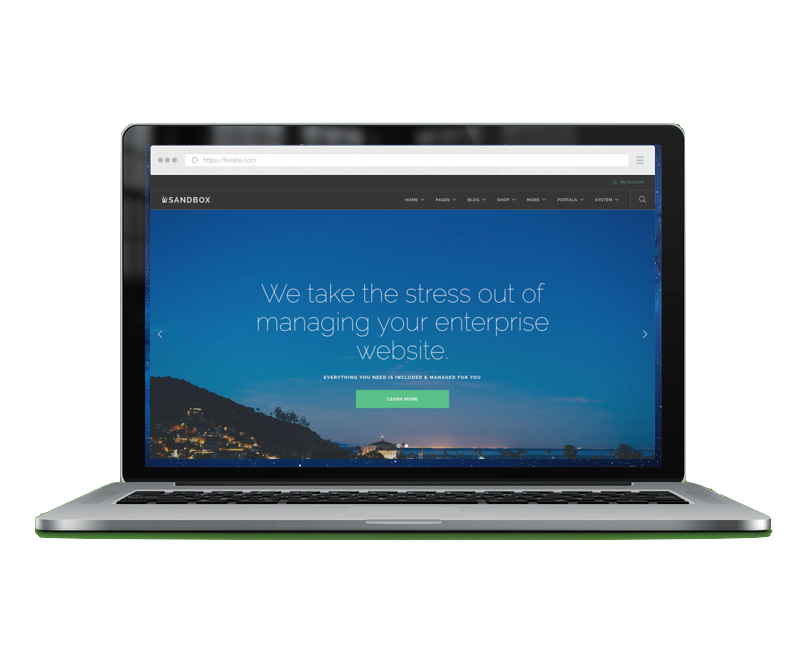 The firm asked us to design a new responsive website for their business so that their clients would need nothing more than a mobile phone to engage and interact with the firm. We studied their competition and designed wireframes to differentiate and convey their mission, values, and services in a concise and easily digestible manner, which is very important since finding the right lawyer for your legal case can be an extremely stressful time. 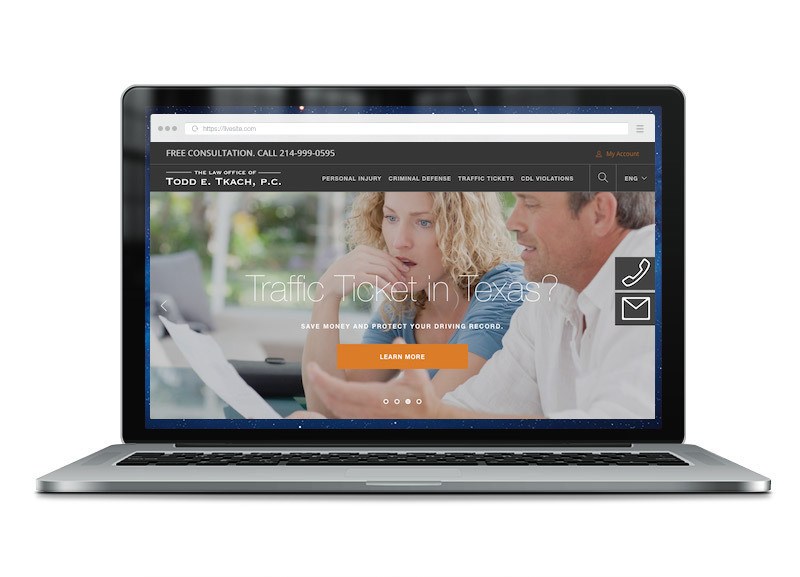 We developed a design and connected it to their call center so prospective clients could click on any website page and talk directly with someone instantly. Analytics to track conversions from prospects to clients was set up months before the new design went live. Over the first 6 weeks after the new design was launched, the website's conversion rate jumped an amazing average of 45%. With liveSite's powerful and flexible e-commerce capabilities and secure portal features, we are now redesigning their automated case onboarding process and case management workflow to seamlessly connect their legal team with their many clients and manage all cases from beginning to end. liveSite has proven to be the perfect website platform to leapfrog our competition and double our business opportunities. With over 16,000 members, three physical campuses, and eight worship venues, Highland Park United Methodist Church is among the largest churches in the country. They turned to liveSite to create their online campus to extend their reach around the globe. 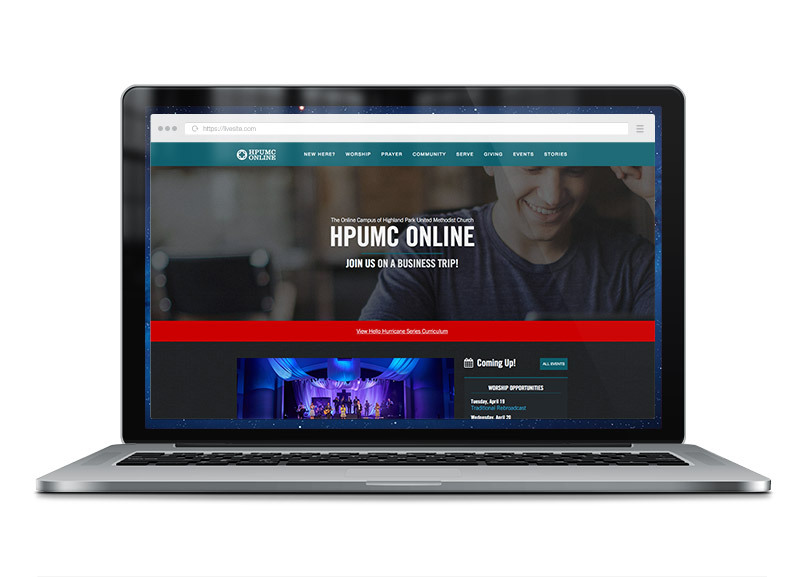 liveSite is the engine of this online campus and allows HPUMC quite a bit of flexibility in design, workflow application development, and the ability to integrate with services from other vendors. liveSite workflow and apps features were leveraged for tasks like email newsletter subscriptions, storytelling, weekly bulletin updates, and small group registrations. Having reached every state in the U.S., and more than 56 countries around the world, liveSite has become an integral tool to help HPUMC spread the Gospel around the world and providing opportunities for people from all nations to join them in worship wherever they are. We created an online campus for our large church quickly and cost-effectively, without sacrificing features or flexibility. liveSite rivals many of the more expensive website platforms. With 71 schools and an enrollment of more than 57,000 students, Garland Independent School District is among the top 100 largest in the U.S. Over 7,000 teachers and supporting staff are needed to provide educational services to this large student population. 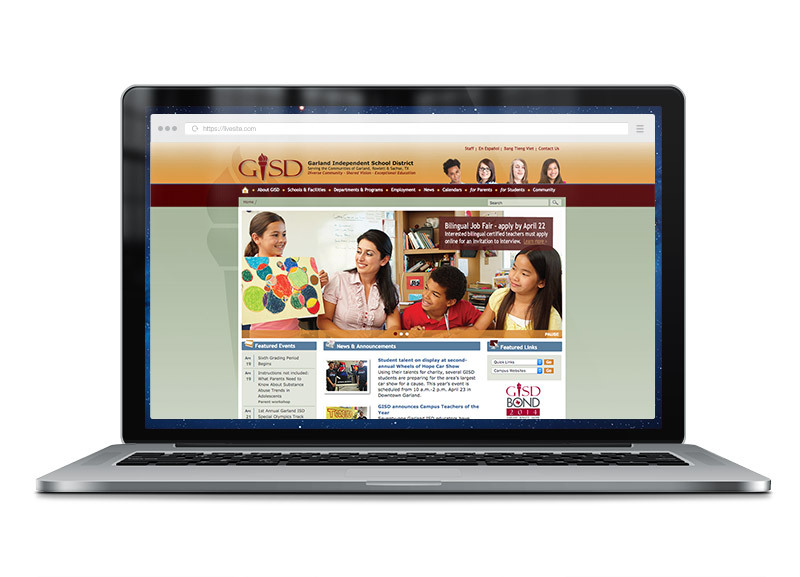 As funding is always an issue, the district needed a private intranet portal to support internal communication and business processes more efficiently. liveSite was installed in their data center, and runs within their private network but is upgraded, and maintained remotely by Camelback Web Architects. Now in it's 6th year of service, the liveSite portal has proven to be the place where each department manages their section of the site to provide documents, training presentations, forms, and policies and procedures needed by district staff to perform their day-to-day duties. It's also become the vehicle to share employee news and promote staff events. Since liveSite doesn't believe in a 'per seat' licensing model, the liveSite intranet continues to grow and saves the district an estimated $210,000/year over similar enterprise solutions that charge a licensing fee for each portal user. I love being able to just send someone a handout and their login credentials and know that they can get started right away. In some cases, users have been able to start sharing their information with the staff who need it without any formal training, which is a testament to the ease of use of liveSite. Transforming The Church is an electronic campus that connects students with others of similar interests from clergy and members of churches all around North America. It allows churches and individuals — previously unconnected — to exchange ideas, projects and education for worship, transformation, mission, outreach, evangelism, stewardship fundraising and other ministries. 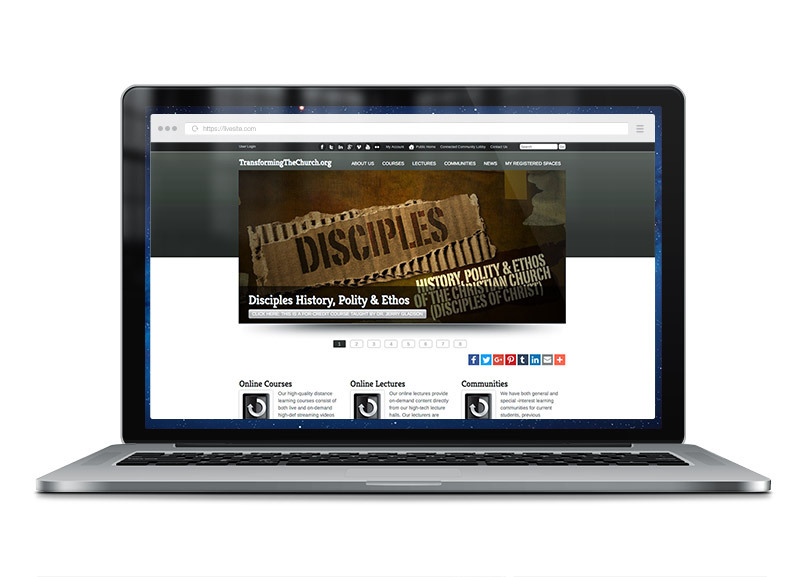 Transforming The Church turned to liveSite to create a website where they can protect online curriculum and charge for access to the content for a limited time. Where instructors could manage their courses themselves and students can participate in a protected community. Because liveSite is such an affordable website platform, Transforming The Church also provides liveSites to smaller churches that need a web presence to start but will need a solution that will grow with them. SkyMedicus is the first HIPAA-compliant, global healthcare marketplace that connects patients and employers directly to the world’s leading healthcare providers through a state-of-the-art patient experience. 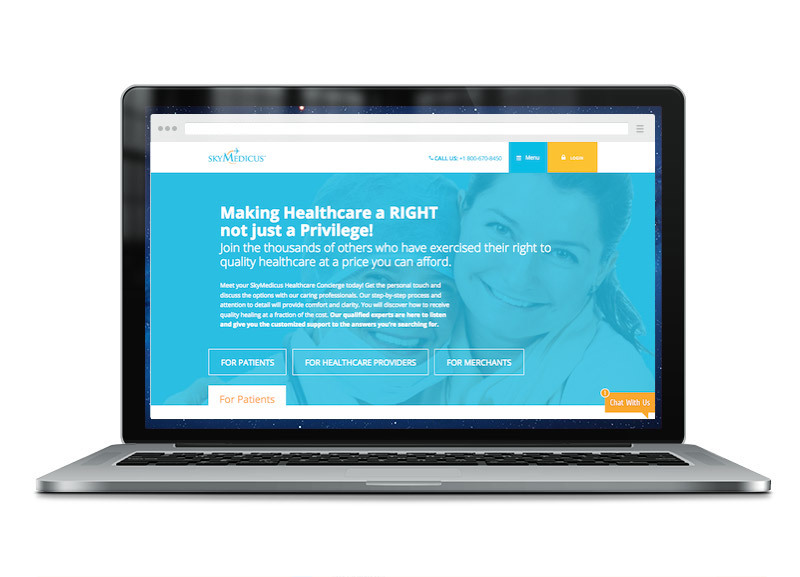 Employers can now easily offer broader access to high-quality and affordable healthcare options for their employees in an easy-to-use, guided and secure environment. SkyMedicus turned to liveSite to help them design and develop a proprietary solution built on top of liveSite's flexible and secure website platform. We created a personalized portal for patients to safely and securely select and communicate with providers, share medical information, schedule and pay for surgical procedures, coordinate travel arrangements, and facilitate follow-up communications. This attention to the total user experience for both providers and patients results in an increase in provider participation and greater patient satisfaction. Bytes of Learning was looking for a new website platform that would move their business forward and provide more services for their customers. They turned to LiveSite and were surprised to learn they could have a full-service site for a fraction of what is normally paid. In a matter of weeks we had their new LiveSite website online. Compared with their former custom site, the new site provided a better customer shopping experience, a more effective way to handle sales and support communications, and compatibility with any desktop or device. The result? They reported that business increased immediately! 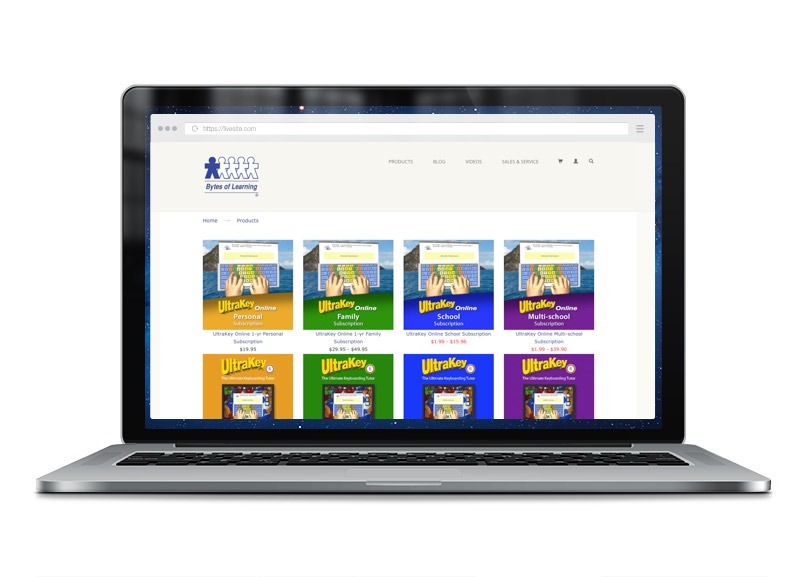 Art Willer, president of Bytes of Learning comments, "Our new site was completed far more quickly, with far more capabilities, and at far less cost than we or anyone else could develop on a custom basis. As a bonus, we have acquired reliable web-based functionality that improves the way we serve our customers. Who could ask for more?" 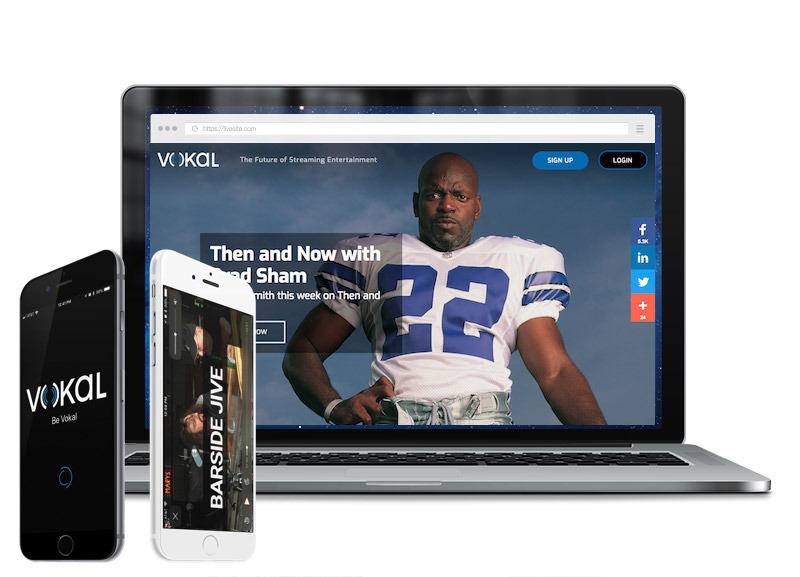 VOKAL Media is a streaming services provider that fills the gap between the DIY Youtube podcasters and the industry giants like Netflix. Many content creators need this third option: sharing in a cost-effective global content delivery platform without giving up too much profit or control. VOKAL Media approached Camelback Web Architects to help them execute on their vision for a seamless delivery platform that would appeal to their audience and strengthen their brand. Camelback Web Architects developed their website and mobile apps across all platforms to connect to their cloud-based content delivery platform and dynamically feed content to their audiences in a thoughtful and pleasing way. Camelback Web Architects went above and beyond developing our website and mobile apps to work seamlessly with our content delivery platform, making us competitive in a fierce industry. I highly recommend them. 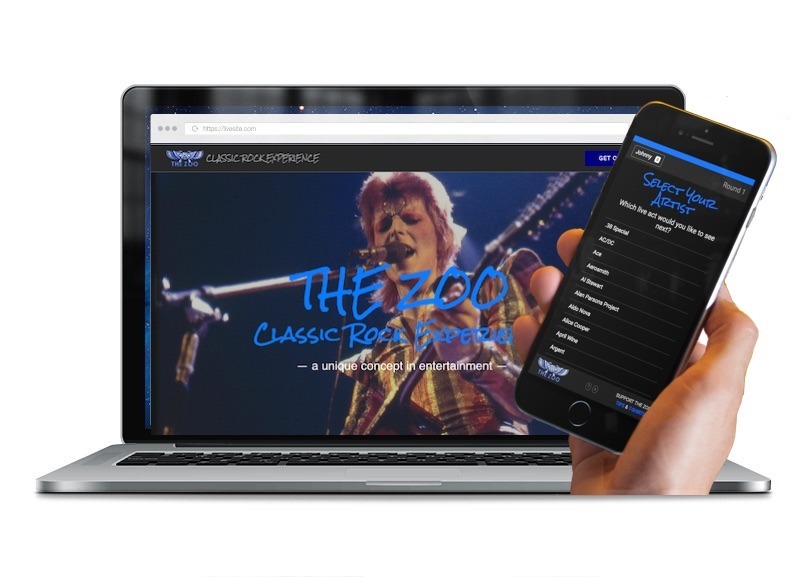 What started as a unique promotional concept, THE ZOO Classic Rock Experience soon developed it's own following and requests from venues and event planners to offer the show to larger audiences. Building on the established brand of a defunct rock radio station from the 70s, THE ZOO Classic Rock Experience is an engaging and interactive time machine into the early and rare live performances of the iconic artists featured on the station. Camelback Web Architects designed and developed the show concept and technology, including the custom video system, liveSite website, game, and mobile app that all work together to deliver this unique and entertaining experience to event guests. The show demonstrates the creativity and innovation of Camelback Web Architects. As HPUMC was leading up to its 100th Birthday, they were challenged with quickly building a microsite to share the story of HPUMC's first 100 years. Knowing that this microsite would need to be repurposed several times, the HPUMC team turned to liveSite knowing that they could quickly build the custom site without any programming without sacrificing page design flexibility. The microsite was configured to gather stories and photos from its 16,000 members with a way for volunteer committee members to access to the information collected. 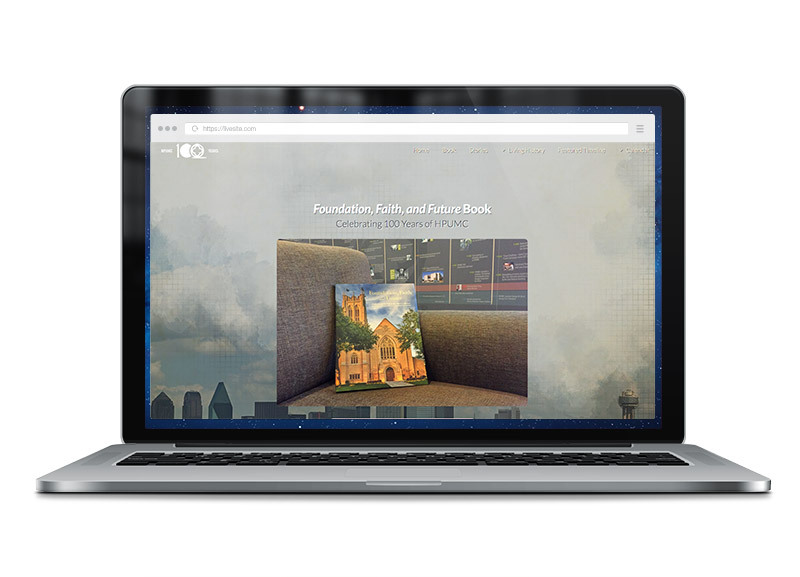 The microsite was also configured to create an interactive timeline to share the history of the church. This complex timeline was actually built in less than a week by the HPUMC team. As the event drew near, liveSite e-commerce features were enabled to sell tickets to the celebratory event and a commemorative coffee table book. Using liveSite, the church saved over $40,000 that was quoted by another vendor. Now that the church has officially turned 100, this microsite will soon be repurposed to meet the communications needs for an upcoming capital campaign. This project called for quite a bit of flexibility on very tight deadlines. liveSite was able to meet the need and helped to create a very effective communications tool for us and the partnership was quite a success.